We spent 3 days in Tokyo before arriving on Amami Island. We stayed at the Keio Plaza, a luxury hotel in the Shinjuku district. At night, Tokyo resembled a huge Times Square. Seemingly every inch of the city was covered in neon. There were lots of Pachinko arcades and also pornographic video arcades! In the daytime, the sunlight was filtered through the thickest layer of smog I have ever seen! Houston doesn't hold a torch to Tokyo when it comes to air pollution. I wandered into a bookstore one day and was very surprised to find that not only do Japanese books and magazines read vertically right to left, but they also start right to left and upside down, so the front covers are really the back covers and vice versa. *Everything* in Japan is opposite. They drive on the left, they read right to left, even the doors lock in the opposite direction to locks at home. They don't say "bless you" when someone sneezes, and they bow constantly, even when talking on the phone! 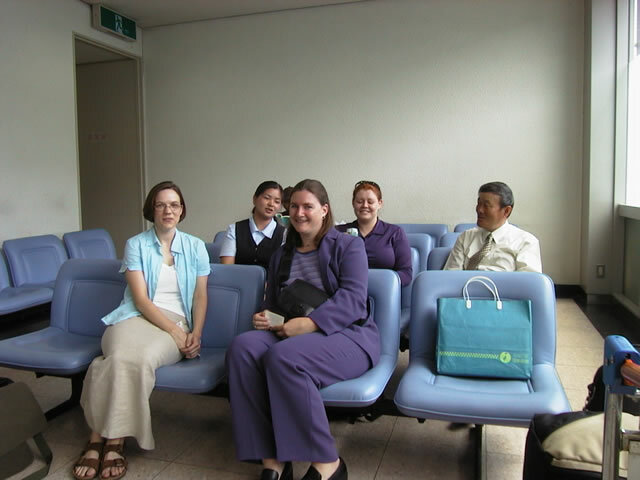 Back (r to l): Japanese student, Australian ALT on Tokonoshima, her boss. Note my inappropriate use of Berkinstock sandals on this occasion. I had green toenails at the time, too. Suzanne, her boss, and part of a baggage cart. Suzanne gazes affectionately at the cart while her boss attempts to attack it with a book? Background: the ubiquitous Japanese vending machines. Warning: The following passages came straight out of my journal during a time when I was experiencing some culture shock here in Japan. If it seems negative, that's because it was. Things are better now (see January). They delivered my stereo today. They took it out of the box, unpacked everything, put batteries in the remote control, connected all the necessary wires, plugged it in, and tested it. I stood by watching in total disbelief. Should I offer them some orange Fanta? Should I thank them profusely while they labor for me on their knees? Should I try to help? I'm not used to receiving such generosity. we had a very fake, very good time. We stayed up until 2 a.m. that night in the hostel talking about all sorts of things. It was good. We've got our first real typhoon of the year. The Internet is painfully slow and the lights have gone out once or twice. I have spent all day in the office, studying Japanese, making a bingo game for Halloween. I have no flashlight, no candles, no nothin'. There's a strong possibility that I'll spend the majority of tonight in complete and total darkness. I rode my bike to Naze Junior High School this morning - in the rain. I had my umbrella with me and I tried to use it while steering the bike with one hand, veering all over the sidewalk, nearly knocking over schoolchildren and then finally colliding with a stone wall, soiling my trousers and embarrassing the hell out of myself in the process. When I finally made it to school, I dropped the bike on my toes. It rained all day. It rained hard. The roof began to leak and the sidewalks began to flood. I thought it would never subside. And then, as if by a miracle, it cleared up just in time for me to ride my bike back home. Last night, I awoke in the wee hours of the morning to find the floor shaking beneath my futon. In my sleep-altered state of mind, I couldn't figure out what was causing the shaking. Was someone downstairs making the floor shake? What were they doing to make the floor shake like that? I fell right back to sleep after it stopped. In the morning, I realized I had experienced my first tremor here in Japan. I had four classes today at Naze Junior High School, if you count the one I was dismissed from. One of my teachers gave a short quiz and then berated the class for about 20 minutes in rapid-fire Japanese while I stood by and fidgeted with my ring, understanding little besides "san pun" (because he repeated it about 20 times with great emphasis) and "Kaneku"
it felt like he was giving them some sort of guilt trip over being an inferior school. In the midst of his tirade, while everyone was silent and listening morosely to his rantings, I dropped my silver ring on the floor. It made a loud clanging noise on the concrete and broke everyone's concentration, then rolled under a student's desk. After his speech, he told me I was free to leave the class. 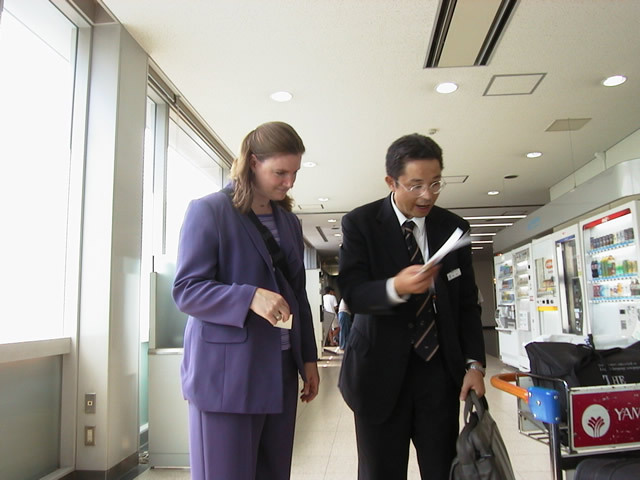 Alex Ferreira, a Kagoshima CIR, called me at the office today and informed me that a transfer to the mainland would be impossible. "This is impossible", she said sadly in her Portuguese-accented English. The finality of her tone made me want to cry. I said thank you and hung up, sat down at my desk in a slump, despondently began correcting a student's speech entitled "My Little Happiness". His little happiness turned out to be afternoon chats with his grandmother about the old days on Amami Island. I changed the title to "Simple Pleasures". Maybe that was too cliché. Maybe I should have left it as it was. The essay asked rhetorically, "What is your little happiness?" Maybe I should contemplate that question more often if I am to remain sane on this island. Just now, a man's voice reverberates through a loudspeaker and circles the streets around my apartment. He's saying something unintelligible in Japanese while a Samba-sounding melody plays in the background. It's absolutely deafening. My thought is, "Shut the f*** UP!" What the f*** could be the purpose of that unholy s***?" The Japanese seem to have no problem whatsoever with invading others' personal space, and that includes listening space. At certain times of the day, one is veritably forced to listen to some jackass shouting over a loudspeaker, or someone screaming about selling sweets, or tinny music at 6 a.m. and 6 p.m. every day, and a woman's deafening voice announcing the time and date in Japanese. her head is so oval, like a little chestnut. Her black hair contrasts with a fair complexion and soft brown eyes. Her eyelashes frequently have traces of eye shadow powder on them. She has an overbite, as do many Japanese. She wears several bobby pins in her hair to keep it back. She looks like a little Japanese doll. Very cute. She's very sweet. She was asking me what I did on the weekends. When I returned the question, she said that she normally worked on the weekends. She said she usually stayed at school until 7 or 8 p.m. Insanity. One of my teachers won't allow her skin to come in contact with sunlight. When driving a car, she wears huge sleeves that cover her arms and hands, a handkerchief around her neck, and a large hat. Basically, I find myself getting into the groove of things, adjusting to my job. Most of the time, I just show up to class and do whatever the JTE asks me to do. I find myself saying words in English and having the class repeat after me, reading dialogue with the JTE, walking around the classroom and checking students' worksheets, giving 5 minute speeches about how I spent my weekend. Today, I found myself quite bored. I know that the students can tell that I am bored, too. I'm not bored every day. Today, I was a bit spaced out, maybe. I find, though, that if there's not something new and exciting going on, I'm not all that excited about being in the class. Anyway, this is just my first year. And will I stay for a second? I must give that some thought. If I don't stay, what will I do? Good question. Go back to work in a library? I think not. Then what? That's the question. How can I already be thinking "What's next?" when I've only been here for 3 months? wondering whether I should stay a second year at all, at all, but knowing that I probably will because I want to learn more Japanese and I don't know what else to do. Damn good reason, that. as soon as I sat down, they went silent and didn't say another word for the entire time I sat there. I thought to myself, if they expect me to try to start up some inane conversation with them in English while they giggle behind their handtowels, they've got another f***ing thing coming. They can just sit there and say nothing. I got up and put my tray away before lunchtime was over. I thought I saw a look of disappointment in the teacher's face. I excused myself and went back to my desk to return to my letter writing. At recess, I walked out to the bus stop to check the bus schedule. 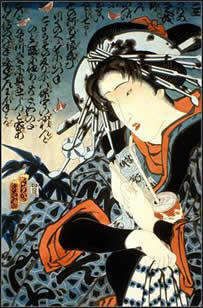 I am so sick of Japanese people expecting, waiting for me to draw them out of their shyness. What if I don't want to? Is it o.k. if I really don't feel like it? I'm sick of Japanese teachers pushing me to draw the students out. What if I don't want to draw them out? Is that o.k.? What if I don't want to always be the one to start a conversation. Is my job to constantly go around every day making conversation with people in a language I barely know and then standing by helplessly as they laugh at the way I use Japanese? Then, I went to Ashikebu. It started out o.k. I sat and tried calligraphy, studied my word cards, otherwise dawdled. Then there was elementary. That was fine. Then came the hell of the san nensei boys. I basically ignored them and figured it would be o.k. The ringleader started breakdancing on the floor. I gingerly stepped around his writhing body to retrieve some construction paper. I sat with the ni nensei girls and tried to make a Christmas card, but I was distracted. I couldn't believe how rude they all were. What had I done to them, anyway? They seemed to get worse and worse every time I came to the school. We ate lunch. During free time, I tried a bit of calligraphy. The san nensei boys came in. The science teacher asked me to draw a picture. I kept thinking that morning how the sleek brush of the calligraphy pen reminded me of a Japanese woman's hair. So I tried to draw a picture of a Japanese school girl. It was terrible. I got up and let one of the others try. He wrote something about a flower that was probably insulting because everyone laughed. I had no clue, so I just stood there. Then one of the others sat down, I had a feeling that he was trying to insult me, so I started to leave. He asked me to wait, but I left. Much later on, I came into the room to find that they had put blue eyes and pink skin on my drawing, insinuating that it was me (I guess they thought I was trying to insult them), then they drew an very mean picture of me. I couldn't believe this. I crumpled it up and threw it away. I was so angry, I couldn't believe that they would dare to be so rude when I didn't even know them.